Kirsty is a senior professional within Guide Dogs with over 15 years sector experience. 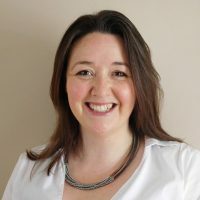 Having integrated ISO44001 collaborative methodology into Guide Dogs, she is passionate about creating relationships with organisations that further inclusivity for all within physical and virtual future environments. Leading the Innovation team, her focus is channelling disruption from Smart Cities and technology revolution into exciting opportunities for organisations to review businesses goals and address challenges they face moving forward. Prior to Guide Dogs, Kirsty worked at IBM Hursley Software Development Laboratory and EMEA Microelectronics Division, both of which enabled her to gain a strong understanding of technology and infrastructure development within commercial parameters.